ProCAST and QForm are software for simulation of different stages of metalwork – for simulation of casting and then forging. 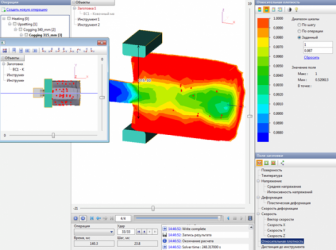 Simulation results from ProCAST software may be imported into QForm which makes it possible to run the forging simulation based on the inherited characteristics of the casting simulation. It is possible to get joint virtual prototypes and sequences of casting and forging processes prior to product manufacturing. 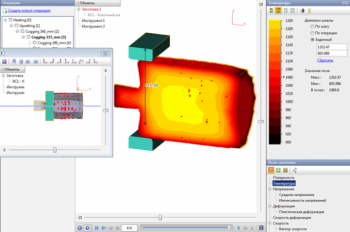 Through simulation of the casting with macro- and microstructure analysis of an ingot it is possible to get: temperature, stress, plastic strain fields and ingot density. 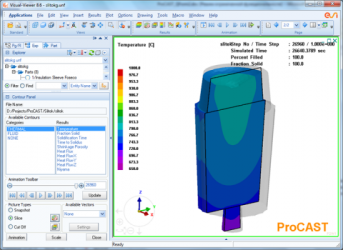 For heating and further forming of an ingot in QForm, finite element mesh is imported from ProCAST as well as temperature and porosity fields. Data are exported from ProCAST as *.unv or*.ntl. files. Simulation example: forging of an ingot with initial geometry and field imported from ProCAST program. The following results of simulation in ProCAST program were achieved. These results are used in further simulation in QForm. Imported porosity field (range of 1-0,987)It is not necessary to prepare geometry for a forging simulation project using imported data from ProCAST program since it is loaded from the *.unv or*.ntl. files along with the workpiece fields. 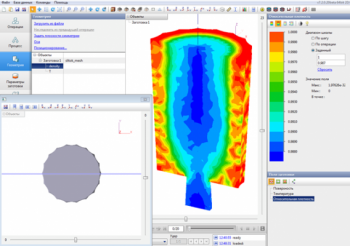 The picture below shows an example of imported ingot geometry and its porosity fields after casting process simulation. 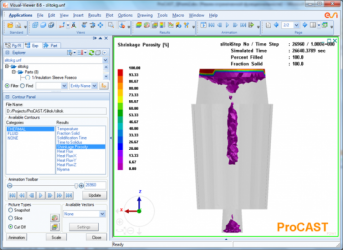 Processes of ingot heating, upsetting and cogging were simulated in QForm program. Simulation results are shown below.